Here’s the bell that never rang. The blanket uses architectural elements and broad strokes of colour to create a highly distinctive repeating motif which draws on the images present in both the coat of arms and the motto. This pattern was originally submitted to the Glasgow School of Yarn Design Competition in 2012 and won both First Prize and the People’s Choice award. 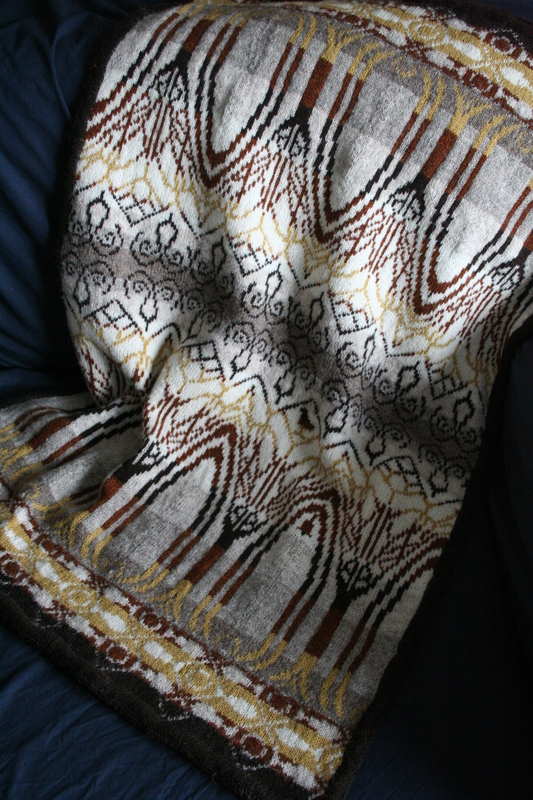 The Kentigern Blanket is knit in the round, steeked and finished with a steek sandwich and i-cord edging. The pattern is modular with two inset motifs. Full charts for the colourwork sections are included. 275yds / 252m Jamieson & Smith 2 Ply Jumper Weight in Cream (1A) or Shetland Supreme in White (2001). 188yds / 172m Jamieson & Smith Shetland Supreme Jumper Weight in Gaulmogot (2006). 188yds / 172m Jamieson & Smith Shetland Supreme Jumper Weight in Katmollet (2008). 75yds / 69m Jamieson & Smith Shetland Supreme Jumper Weight in Sholmit (2007). 450yds / 412m Jamieson & Smith 2 Ply Jumper Weight in Dark Brown (5) or Shetland Supreme in Shetland Black (2005). 200yds / 183m Jamieson & Smith 2 Ply Jumper Weight in Brown (122) or Shetland Supreme in Moorit (2004). 150yds / 138m Jamieson & Smith 2 Ply Jumper Weight in Gold (28). 60cm / 3mm (US 2½ circular needle (for main body), 2 x 200cm / 3mm (US 2½ circular needles (for steek sandwich / edging – the longer the better), 3mm circular needle or DPNs for i-cord edging, 8 stitch markers – two types (four of each), 2.5mm (US 1½) crochet hook and waste yarn for the steek, tapestry needle for weaving in ends. Approximately 29” x 39” / 75cm x 100cm once blocked. Buy now via Ravelry or Craftsy!